First off, there are toys. 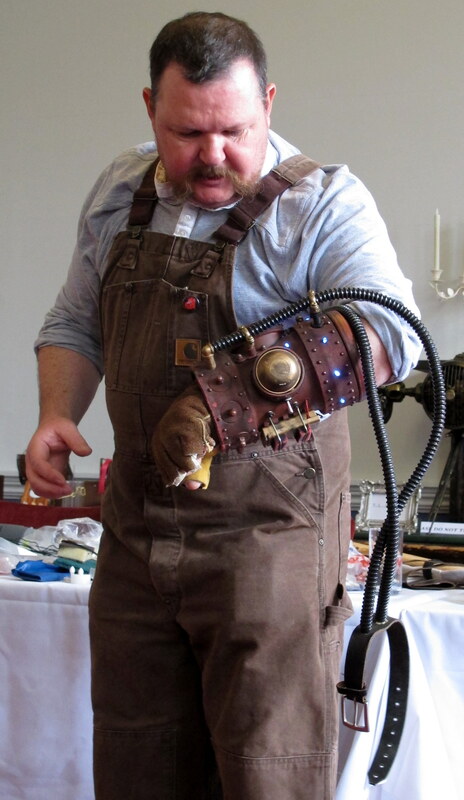 At any Steampunk cosplay event you can be sure you will see suped-up Nerf guns and squirt guns that look like they walked right out of an H. G. Wells story. 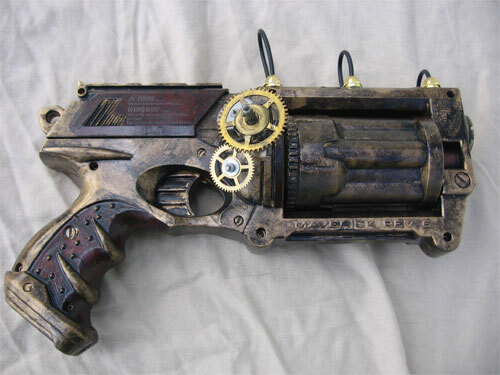 But keep in mind that if you want to paint a plastic gun that spray paint will chip over time. If you scour your plastic surface ahead of time with steel wool, sand paper or even a kitchen scouring pad you will create pores for the paint to adhere to and it will last much longer. Kinex is a line of plastic engineering toys so it is a great way to get lightweight and cheap plastic gears that you can paint to look like metal. At another session at The Asylum one of my favorite items was a remote-control Dalek toy that a maker punked by adding metallic paint and little makeshift boiler on the back. Plastic pipes, like the ones you can find at the hardware store, are also really useful. Just like plastic guns, they need to be roughed up before you paint them, but they are relatively easy to drill into with a small electric drill so they are easy to embellish. Major Quicksilver had an amazing “power glove” that he built by attaching a leather work glove to the interior so the fingers were flexible even though the gauntlet was rigid. 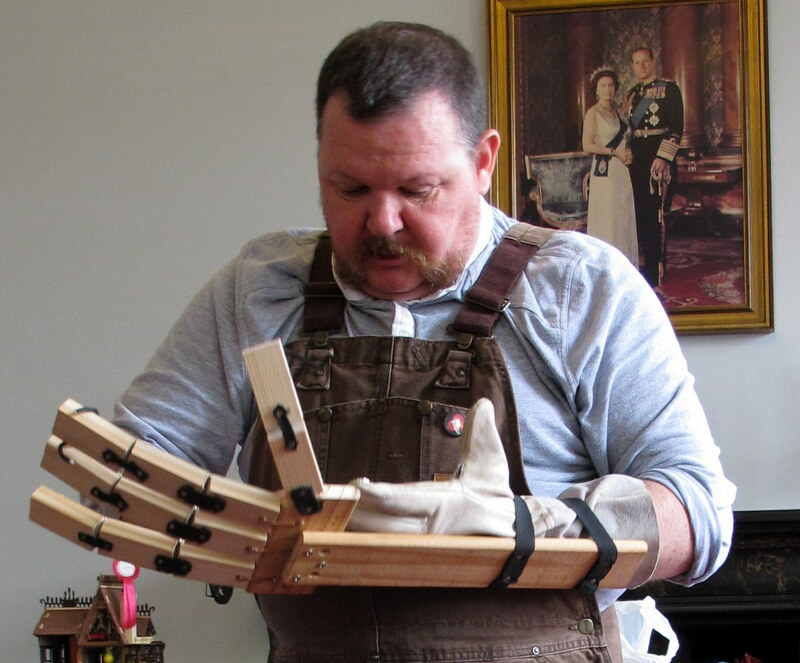 It was enhanced by flexible plastic tubing and a leather strap that attaches to the upper arm. The good Major also told the crowd all about a wonderful malleable plastic called polymorph. It comes in the form of little beads and you can melt them in boiling water on your stove. After they become gel-like and come together in a glob you have about five minutes to mold it into any shape you want. And if you don’t like the result you can just put it back into the hot water and start again. Of course, you have to be careful about burning yourself when you take the polymorph out, so if you use something like welders gloves it will protect your hands. It usually comes as a transparent plastic, but you can add dyes or paint it later. Once it is solid it is a great material to drill into or file.